According to World Health Organization figures between 300 million and 500 million people are infected annually by the disease worldwide. It is endemic in 106 nations, threatening half the world’s population. Twice as many people die of it than a generation ago. Malaria is the world's deadliest disease and the world's number one parasitic killer. It kills an estimated 1 million to 3 million people a year. About 90 percent of the victims are children under 5 in poor countries in Africa. A child dies of malaria every 12 to 30 seconds and about 25 percent of all childhood deaths in the Third World are the result of malaria. Malaria-carrying mosquitos have probably dispatched more humans than all the wars in history. In the history of the world only the plague (and perhaps someday HIV) have been as deadly and destructive. Malaria also costs developing countries billions of dollars in lost wages, business and tourism every year. The cost in Sub-Saharan Africa alone, where it is not uncommon for poor families to spend a quarter of their income on malaria treatment, may be as much as $30 billion according to the United Nations. 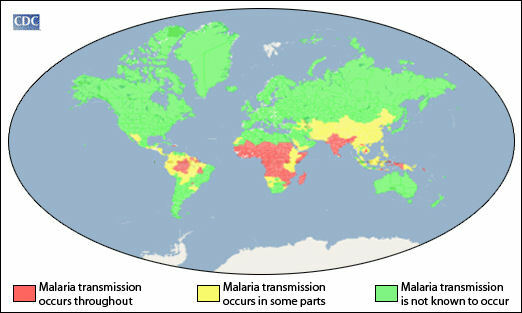 quinine Malaria is most common in sub-Saharan Africa and Southeast Asia. It is found mostly in tropical regions, especially in swampy areas or places where there is a lot of still water (where malaria-carrying mosquitos breed). Often incidences of the disease are highest in the wet season. The London School of Hygiene & Tropical Medicine has traditionally been a leader in malaria research. Book: The Fever: How Malaria Has Ruled Humankind for 500,000 years by Sonia Shah (2010, Sarah Crichton Books, Farrar, Straus & Giroux). malaria spleen Malaria infects bats, snakes, birds, lemurs, monkeys and mice as well as humans. An ancient disease, it probably killed man’s earliest ancestors and may have infected the dinosaurs. Some scientists believe that one out of two people who have ever lived died of malaria. The species of mosquito that causes yellow fever and malaria are believed to have diverged about 150 million years ago. The ancient Egyptians, Chinese and Greeks are all believed to have suffered from malaria. 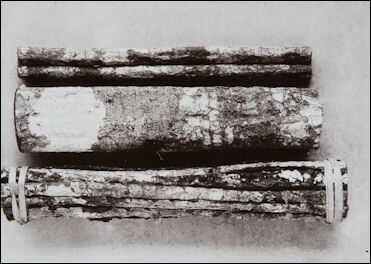 Some Egyptian mummies show signs of it. Symptoms of the disease were described by Aristotle, Homer, Socrates and Hippocrates and in Nei Ching, the Chinese canon of medicine, which dates back to 2700 B.C. The decline of some Greek city states and the fall of Rome have been attributed to malaria. Alexander the Great likely died of malaria. It may have stopped the armies of Attila the Hun and Genghis Khan. 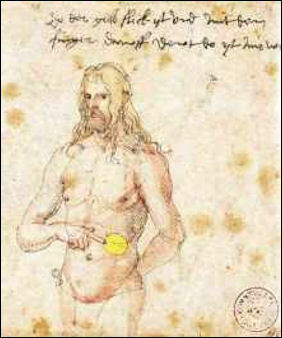 Malaria remained a problem the Middle Ages, Renaissance and Enlightenment. Oliver Cromwell and the Italian poet Dante are thought to have died of it and Shakespeare alludes to it in eight of his plays. In Europe malaria spread as far north as London and Russia. In the New World it made it way to Montreal and Boston. Among the remedies taken in Europe were viper’s broth, crab’s eyes, live spiders worn on a necklace and dead spiders congeal in butter. The first malaria relief known in the West was derived from the bark of South American cinchona tree, a remedy used by the Incas to prevent malaria and introduced to Europe by the Spaniards as a treatment for the disease. A close cousin of coffee, the cinchona tree is naive to Ecuador and Peru. Local people called it quina quina (“bark of barks”). quinine cinchona The tree was named after the Countess Chinchon, a Spanish countess who was cured of malaria with the bark while visiting Peru and was so grateful she distributed the bark for free to the poor of Lima and brought some back to Spain. The story is nice but more likely the bark was introduced to Europe by a Jesuit missionary. In 1632 it reached Italy and quickly the demand became overwhelming. Harvested by indigenous laborers, it was carried to the Pacific coast and shipped to Europe, where it was sold for a fortune. Both Europeans and Americans were dependent on Peru and Bolivia, which controlled the quinine market, the only known treatment against the disease. 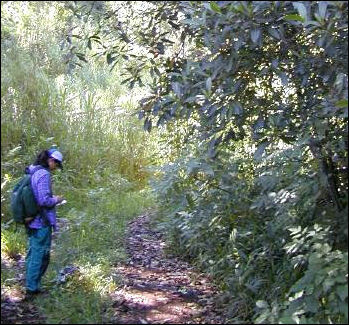 Many died in treks over the Andes into the clouds forest where the cinchona trees thrived in an effort to bring back seeds and saplings of the plant. It wasn’t until the 1800s that the cichona tree was successfully raised outside of South America---on plantations in India, Sri Lanka and Java. In 1829 quinine was purified from the chinchona bark. It works by disrupting the parasite’s reproduction. It saves thousands maybe millions of lives but had many drawbacks. It was effective for only a short time. Among it side effects were hearing loss. malaria in the U.S. 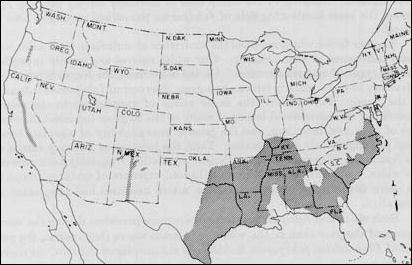 In the 18th and 19th century malaria racked southern Europe and the United States in epidemic proportions. George Washington, Abraham Lincoln and Ulysses S. Grant all suffered from it. Foggy Bottom in Washington D.C. refers to the malaria miasma that clung to the wetlands around the Potomac. Malaria in the nation’s capital was so bad some suggested putting a wire fence around it. A million Union Army casualties were attributed to malaria. The British suffered terrible from malaria in India. To avoid the disease they established hill stations and added quinine to their gin and tonics. The full scale conquest of Africa by Europeans did not take place until quinine was widely used there as a malaria prophylactic. See Africa, India. In 1897, Ronald Ross, a British physician working for the Indian Medical Services in Hyderabad, India discovered that malaria was carried by a mosquito. He dissected an anopheles mosquito that had just fed on a malaria patient and found the P. flacipaurm inside it. He won a Nobel prize in 1902 for his work. Until the 1940s, malaria was found throughout Europe, Asia and the Caribbean and was common in Italy and Spain and the Mediterranean region. The American campaign in Italy in 1943 was slowed more by malaria than it was by war wounds, Nazis or Italian troops. In the Pacific theater of World War II, casualties from malaria exceeded those from combat. The Center of Disease Control was set up in Atlanta not Washington at the end of World War II with the primary mission of controlling malaria because the disease was still very much a problem in the American South at that time. Malaria was eradicated in the United States in 1951 thanks mainly to DDT( See DDT Below). Chloroquine, the first synthetic malaria medicine, was developed in the 1940s. It was cheap, safe, effective and long-lasting---and was nothing short of a miracle drug. Laveran malaria drawings About 90 percent of all malaria cases and deaths occur in tropical Africa. As many as 1 million children under the age of five are killed by the disease there every year, with as many as one in 20 children dying in places where the disease is especially endemic. Even though Africa has alarming AIDS infection rates, many doctors say malaria is a much more serious problem. Many malaria sufferers also have HIV or tuberculosis. Getting one disease makes it easier to get the others. An African child has an average of between 1.6 and 5.4 episodes of malarial fever each year. Surprisingly, though, the disease accounts for population rises rather than decline as couples have six or seven children to ensure that three or four survive. Malaria cost Africa $12 billion a year, or 40 percent of it public health spending. No anti-poverty program in Africa can be regarded as adequate unless it also addresses the malaria problem there. According to WHO study, malaria is expected to cause the economies of countries where the disease is endemic to shrink by 20 percent over 20 years. Some estimate $3.2 billion a year is needed to prevent and control malaria in Africa. In 2004 only $600 million was spent. In some parts of Africa, residents receive an average one infectious bite a day even if they take precautions such as using bed nets and window screens. During the rainy season its is not unusual for entire villages to get struck down by disease, with villagers lying, shaking and sweating in bed, too ill to work, eat or even stand up, and weakened for the rest of the year. The disease is exceptionally common where people live in mud huts, which constantly have to be replastered with mud dug from holes, which fill up with stagnant water. Many Africans have built a resistance to malaria but still regularly come down with the disease anyway and receive minimal or no treatment when they do. Most places don’t even have microscopes needed to check for protozoa and correctly diagnose the disease. If someone has a fever it is simply assumed they have malaria. Malaria prophylactics are rarely used. They are fine for tourists visiting for a few week or two but for long term use by local people: they have too many bad side effects and are too expensive. 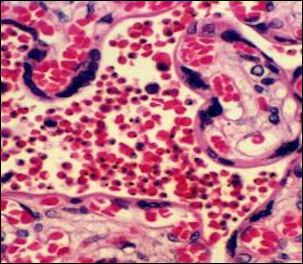 knowlesi Malaria is caused in humans by four single-cell parasitic protozoans of the genus Plasmodium . It is transferred from person to person by a form of the protozoans called gametocytes that are extracted from a human victim's blood and transferred to other humans by the Anopheles species of mosquito. The plasmodia live in the mosquito’s saliva and enters the human host when the mosquitos sprays saliva into the host’s blood to inhibit coagulation. About 50,000 plasmodia can fit on a period in this sentence. Usually dozens enter the bloodstream. Only one is necessary to kill a person. They are in the blood stream for a few minutes riding the blood flow to the liver, where they burrow into liver cells. The malaria parasite is quite sophisticated. While the viruses that cause polio, measles and even HIV are made up just a few genes, malaria protozoa has more than 5,000 genes. This high number allows it mutate and fend off threats form new drugs. The protozoa’s greatest asset for survival is its ability to defeat the human immune system by continually changing its surface proteins and its location in the body. infected placental malaria Malaria mosquitos need to drink blood very three days, They are most active in the rainy season and are attracted by the odors and warmth of human bodies. A single feeding can last 10 minutes, with the mosquito ingesting 2½ times its pre-meal weight. Malaria thrives in tropical areas where the climate is right for the specific mosquitos that carries the disease and there is a lot of rain and stagnant pools of water for mosquitos to breed. There are at least 60 species of Anopheles worldwide. The Anopheles gambiae , native to Africa, spreads the diseases because it bites human 95 percent of the time. Anopheles freeborni , found in the United States, is capable a of giving a more potent dose of the disease but is poor vector because it prefers animals to humans. Gambiae breed in stagnant water and are particularly effective spreading disease. They gather in neighborhoods and villages at night, slip into houses at dusk and bite quietly at night. They digest their "blood meal" while resting on the walls of the house and slip away by the morning. In 2002, scientists published the genome---a map of all the DNA---of the mosquito that carries malaria. It turns out the genetic make up of this mosquito is less complex than for the one that carries yellow fever and dengue fever. cells infected with malaria Malaria is transferred to humans by the female Anopheles mosquito. Each person who has malaria has the potential of infecting hundreds of others as each mosquito that bites him or her can carry the disease to several other people. The malaria cycle begins when: 1) The female mosquito gets a stomach is full of blood and starts producing eggs and mates. When she bites a human about 50 sporozoites---the free-swimming form of the malaria parasite---are transferred through the mosquito's salivary glands to the blood stream of her victim. 2) Inside their human host, the sporozoites move to the liver and take up residence in a small area there and eat and multiply non-stop until each parasite that entered the body has replicated itself about 40,000 times. 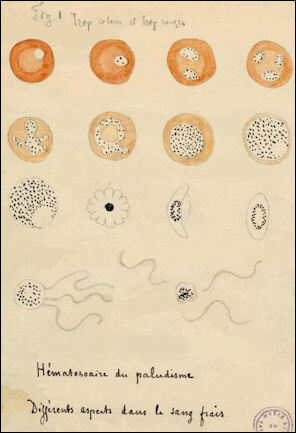 Though they can remain there for many years, the sporozoites usually mature and rapidly multiply asexually over a period of less than four weeks, producing offspring known as meroziotes. It takes about a week or two from the time a human host is bitten to the time when he get sick. Several dozens sporozites can produce produces millions of meroziotes. 3) When the liver cells reach their capacity they rupture, releasing meroziotes into the bloodstream, where they invade red blood cells and feed on hemoglobin, growing and deforming the cells they come in contact with, causing malaria. It takes only about 30 seconds for the meroziotes to expand out of the liver into the bloodstream and find red bloods cell to drill into. Over two days they devour the cell and then burst out again into the bloodstream. This is when the body’s defense begin to respond and the host first begins to feel sick. Two or three days after the red blood cells are invaded they rupture, releasing new meroziotes which attack more red blood cells. Each time the red blood cells rupture the victim experiences a bout of fever. At this stage the body may contain 30 billion meroziotes or more. If a person is infected for the first the response of the immune system is too little too late: and the reproduction cycle of malaria continues at an exponential pace until there are billions of parasites. The symptoms in host intensify and he can become so feverish he almost boils to death. 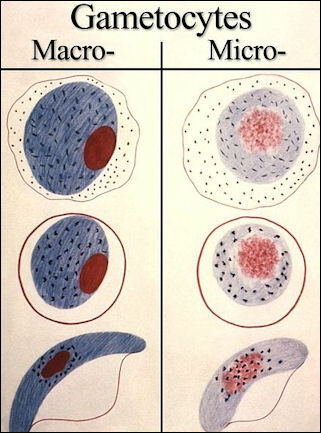 4) Within the red blood cells some meroziotes develop into a sexual form of the microbe called gametocytes, which do not produce symptoms in the human body but are transferred to the mosquito when the mosquito bites. The sexual meroziotes reproduces in the mosquito's stomach, producing, zygotes which invade the mosquitos mid gut, producing oocysts. The oocysts release sporozoites. If these sporoziotes enter a new human victim and a new cycle begins. There are dozens of different kinds of Phasmidia. The four types that infect humans with malaria are: 1) falciparum, 2) vivax (three day), 3) malariae (four-day), and 4) ovale (egg-shape). 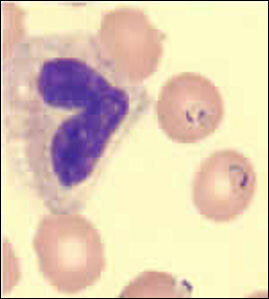 Plasmodium vivax and to a lesser extent Plasmodium falciparum are the most common forms of the malaria-causing protozoans. Plasmodium falciparum account for more than 90 percent of the world's malaria. It is found mostly in Africa. Vivax is found mostly in South America and Asia. It gets it name from the intense way the merozoites vibrate inside the red blood cells. It is the hardiest form of malaria but is les dangerous to humans than Plasmodium falciparum . It can survive in nontropical regions and withstand a variety of anti-malaria drugs. falciparum Plasmodium falciparum is the most lethal and prevalent form of malaria. Found in Africa, Latin American and Asia, it accounts for half of malaria cases worldwide and 95 percent of malaria deaths. It is the only type of malaria that infects the brain. About 1 percent of the people infected by it die and can strike with shock and awe speed and power. It is not unheard of children with Plasmodium falciparum to go to school in the morning and die in the afternoon. 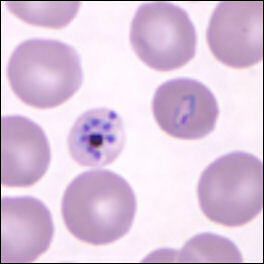 Plasmodium falciparum thrives in the hot, moist areas of sub-Saharan Africa and Southeast Asia. Named for the scimitar shape the parasite gives red blood cells it attacks, it causes severe anemia and occludes the blood flow through capillaries in vital organs, which can causes death. Carbon dioxide exhaled from human attracts the mosquitos. Studies have shown that the plasmodium are able to manipulate mosquitoes’ behavior by making infected human smell more attractive to them when the plasmodium is ready to be transferred into a humans blood and making humans smell less attractive when it is not advantageous for them to bite. Some wonder whether the plasmodium might also be able to manipulate humans in subtle ways. 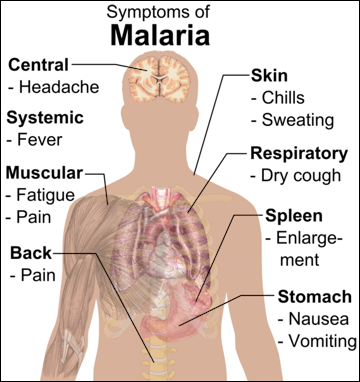 Malaria symptoms Malaria usually begins with the sudden onset of violent chills followed by a very high fever, often accompanied by crippling headaches, convulsions and delirium.. The wife of one victim told Smithsonian, "It is a terrible thing to have. Sweating. Very bad headaches. High, high fever. You vomit. You are so weak...when malaria comes every few days, you feel like you want to die." The symptoms usually appear 10 to 15 days after a person is infected. The telltale malaria symptom is an enlarged spleen. The fever can be up to 108̊F. Other symptoms include malaise, joint pain, muscular aches and diarrhea. Some people with malaria fall unconscious or shake so badly they have to be tied to their bed to keep from falling off. Others produce urine stained red from hemoglobin released from their exploding red blood cells. Anemia is common because the malaria parasites thrive by eating the red blood cells they infect. Parasites feeding on oxygen-carrying hemoglobin in the blood cause blood cells to stick to blood vessel walls, and, in serious cases, blocking the flow of blood and damaging the brain, liver, kidneys and other organs. This can cause respiratory distress, kidney failure, bleeding disorders and other degenerative ailments. Children die because they are much more vulnerable to anemia and convulsions. Malaria symptoms can appear as soon as 8 days or as long as several months after infection. Attacks may subside and reoccur periodically throughout one’s life. People who get the disease repeatedly have less severe symptoms each time but are very tired and lethargic each time it strikes. Regular bouts of the disease may lead to life-threatening anemia, delirium, respiratory failure. coma or death from exhaustion. 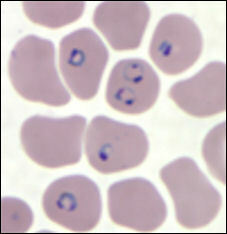 Gametocytes plasmodium One of the worst kinds of malaria is cerebral malaria. Protozoans attack blood cells in their brain and stick to cell walls there, blocking the blood flow. Victims are often so debilitated they lie absolutely still and have difficultly opening and closing their eyes. Ten percent of cases result in permanent brain damage and another 10 to 50 percent of victims die. In cases of cerebal malaria, falciparum- infected cells grow Velcro-like knobs that allow them to pass through the capillaries of the brain, where they attach themselves. For reasons that are not understood, the presence of the parasites causes the brain to swell. This is when malaria is at its deadliest. So many red blood cells have been attacked that oxygen fails to reach vital organs. The heart has difficulty beating, the lungs fail to function. The blood becomes acidic. The victim begins convulsing and falls into a coma. Research has shown that malaria increases the likelihood that an HIV-infected person will pass on the AIDS virus to others. Many people with malaria also have worm infections, which place a heavy burden on the body. Malaria is particularly destructive in pregnant women and children because of their weak immune systems. The very young can die within 24 hours of the first onset of symptoms. Text Sources: CDC Health Information for International Travel, U.S. Department of Health and Human Services; National Geographic, New York Times, Washington Post, Los Angeles Times, Times of London, The New Yorker, Time, Newsweek, Reuters, AP, Lonely Planet Guides, Compton’s Encyclopedia and various books and other publications.